Homepage / Bird/Aves / Can You have an Owl as a Pet? Can You have an Owl as a Pet? If the legislation of the country where you live permit, it is possible to adopt one of these birds of prey. Now, you have to be willing to meet the specific needs of a wild animal. “Unusual” animals are fashionable, and more and more people are venturing to adopt an “exotic” pet. Well, the possession of the owl as a pet has grown in recent years. There are even very tender videos about some of them when puppies, which demonstrate their innocence and beauty, but … can we have an owl as a pet? Is it possible to have an owl as a pet? As long as the laws of your country allow, yes, you can have an owl as a pet. While it is true that we should keep in mind that the owl is a bird of prey and therefore wild. This means that your behavior will not be that of a “normal” pet and will require a lot of care that you should be willing to provide. If you still decide to have an owl, we advise you to adopt it as a puppy. That way, it will grow in a family and home environment so you can better adapt to life as a pet and you can teach it what you want. Make sure there is enough space in your house or in a garden for the owl to fly, remember that you should reproduce as much as possible in your natural habitat. If after pondering all this, you still want to have an owl as a pet, we will give you some guidance on your care. 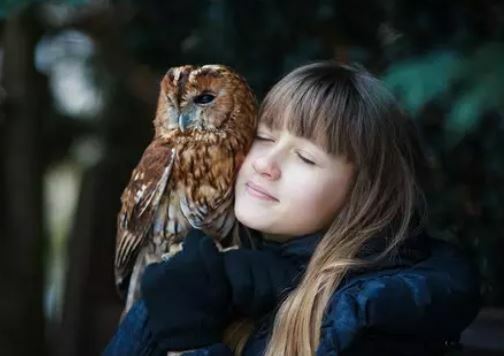 Before you adopt an owl as a pet, you should read all you can about this and your care. Also, talk to a trusted veterinarian and even report to a zoo you know, because any information you may collect may be useful at some point. We do not live in the forest: if you live in an apartment, you can not have an owl as a pet. The owl will need a place to fly, and this place must be safe so that it does not escape, obviously, and release its instincts. Although owls are very independent in their natural habitat, they are not independent when in captivity. So when there is someone around, they demand attention and will ask that of you. Even if you release her in the garden, she will begin to fly and demand your attention. This could cause problems with the neighbors too, so be sure – that, to release it, will have time to be with her. In addition, owls exchange their feathers every year and can spend months eliminating those that no longer serve them, so you will have to constantly clean your home. Owls, as we said before, are not pets, so they can not be fed with feed, but with the original feed. Do you already know what owls eat? Rats and small mammals. This means that you will have to get these foods for your owl, which is not easy and sometimes a little disgusting. Needless to say, you can not have an owl as a pet if you have hamsters, birds, cats or dogs, because they may disappear without you noticing. The owl is not a predictable animal, although several researchers try to study it, it has never been possible to determine a pattern of behavior. What we want to tell you is that you should always be alert, because with an owl as a pet you never know what can happen. To avoid this, the best thing to do is, after adopting an owl cub, take it to a professional trainer . It will set some guidelines and train some behaviors that you can then maintain. As you can see, having an owl as a pet may not be a good idea. We have to take into account also that we are taking a wild animal out of its habitat, but if you venture to adopt it, do not forget to follow our tips. Previous post Food Allergies in Cats, What are The Symptoms and How to Treat it?? Next post What is the Gestation Period for a Cat?